After the floral glitz of last week's garden show, my own garden is a big let-down! 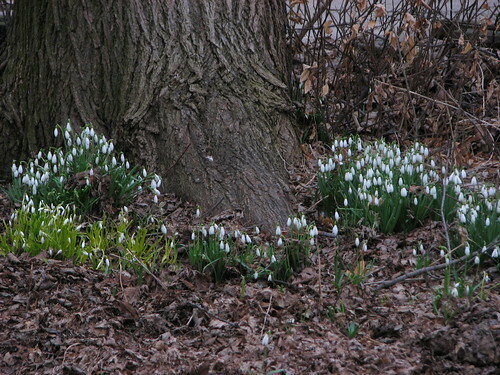 I only have two little tufts of snowdrops blooming. Luckily I can enjoy my next door neighbor's much more impressive display instead. The blooms will be so much better next month! 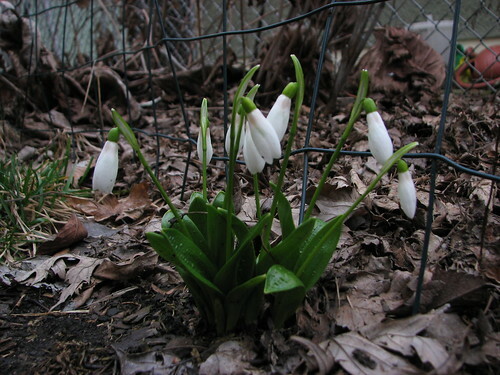 In the meantime, check out everyone else's blooms, hosted by Carol at May Dreams Gardens. Crassula ovata 'Gollum', Crassula muscosa, hedgehog, Crassula rupestris x perforata 'Baby Necklace'. Omg cute!! Not a new purchase, but I put it here so someone will ID it for me. Crassula something? Echeveria something? It had some serious phototropism problems so I cut it into straight sections that are now rooting in various pots. 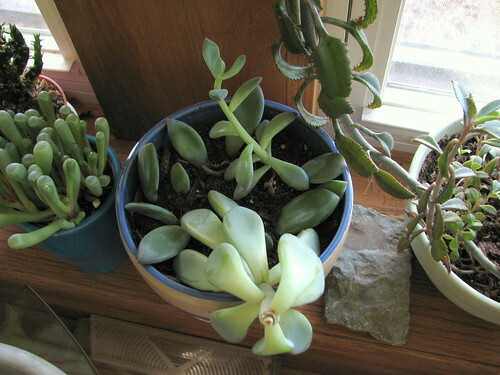 If even half of these leaves and stem cuttings take root, I'm going to have way too many of this plant. But that doesn't stop me, of course. 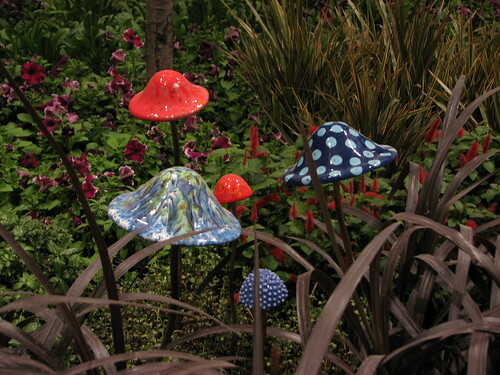 It should surprise no one that I looked forward to the "Alice's Wonderland" garden most of all. 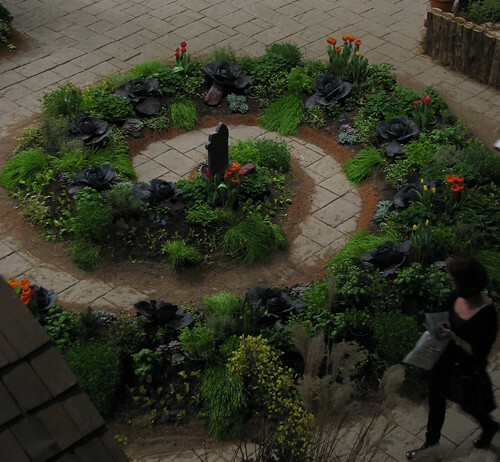 In keeping with the show's "Cultivating Great Performances" theme, the garden incorporated live-action elements of Lookingglass Theatre's "Alice." Unfortunately I did not get to see Alice herself hanging from the ceiling, but I did experience Tweedledum and Tweedledee playing catch and the Queen of Hearts (on stilts!) playing flamingo croquet with the Jack of Hearts. 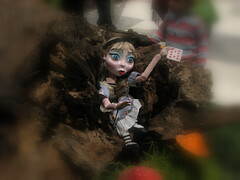 The garden was not the Garden of Live Flowers but rather a mixture of elements of Lookingglass Land (the chessboard, the mirror) and Wonderland (the rabbit hole, croquet match, and tea party). 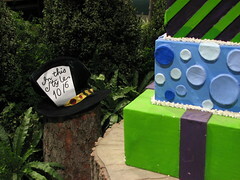 I enjoyed the textures of the checkerboard groundcover and crushed glass pathway, and there were lots of little hidden things to find like the Cheshire Cat's grin and the Mad Hatter's hat. 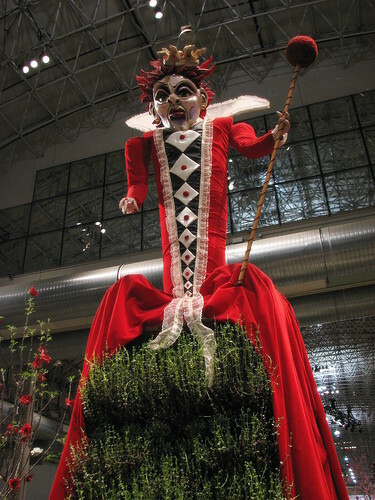 The Red Queen is not nearly so foreboding in the book; I suspect this Red Queen was finding her vertical-garden dress a bit damp. There were so many other things to enjoy that I couldn't possibly cover them all, but here are some highlights. 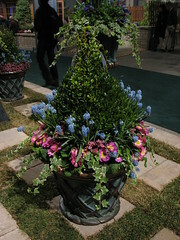 The Broadway in Bloom display along the main "boulevard" of the show floor consisted of containers planted to reflect the seasons. 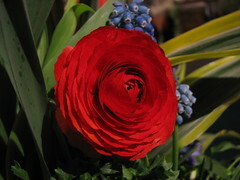 They were gorgeous and included some unusual flower choices including this stunning red ranunculus. 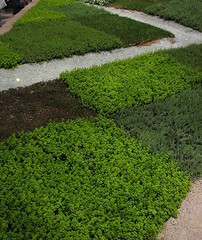 The Art of Bonsai garden from the Chicago Botanic Garden was really lovely. 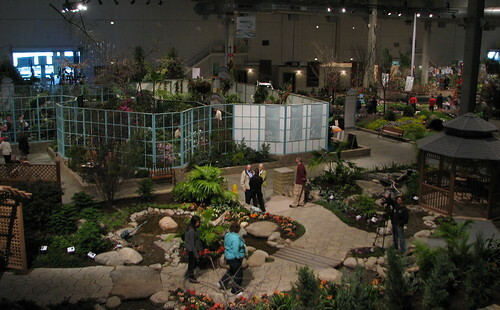 The CBG has so many options for its show entry and I appreciated their choice of a quiet, somewhat austere bonsai garden. 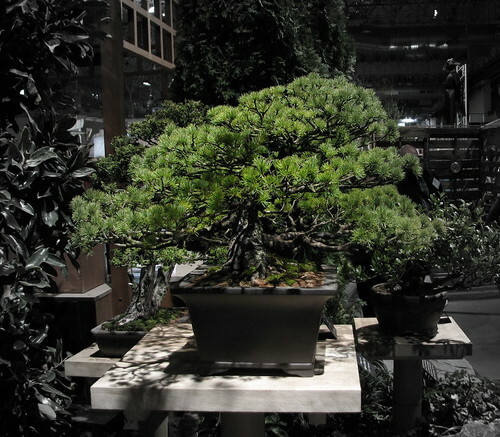 Bonsai are extremely cool and I know I would never have the patience for it so I respect people who do. 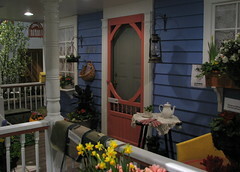 "Our Town: Your Garden" was one of my favorites because it looked like a place where I could happily spend an afternoon. 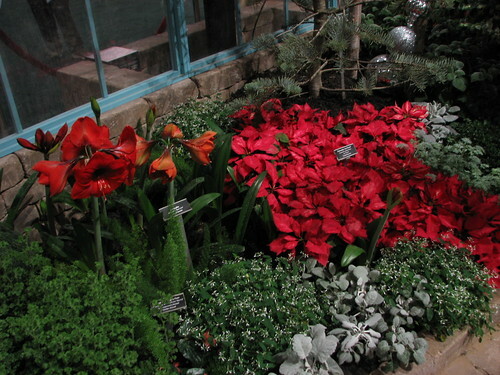 Many of the displays were too heavy on the greenery and hardscape but this garden really popped with bold colors. 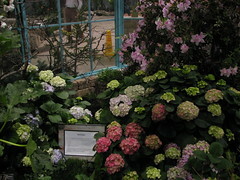 It was designed in collaboration with the Arthritis Foundation, which has a display every year; instead of being overly commercial, they always do a good job of integrating their tools and ideas nicely into the environment. The irony of the "Our Town" garden of course is that actual stagings of "Our Town" have minimal set pieces, a few chairs and two stepladders if I remember right. This was better; how many plants can you stack on a stepladder, anyway? Oops, there I go giving myself ideas. I have never been a fan of the tablescapes in the past but this year I enjoyed several of them, particularly the ones that did not sear my retinas (I'm looking at you, carousel horses!). 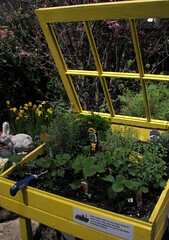 "Spring Awakening": Hey, now I know what a potager is! This spiral was cute but even better was the mix of cool colors with a handful of hot orange for drama. The Garfield Park and Lincoln Park Conservatories shared a wonderful space that took full advantage of its air rights so there were plants in every direction we looked. 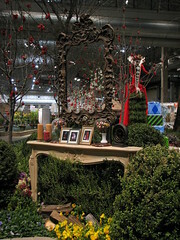 I was a little puzzled by the levitating dead tree; it seemed to fit better in the "Wicked" garden. 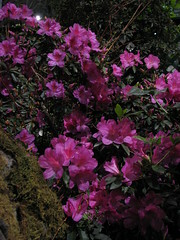 The azaleas on the other hand were a knockout. The "Jekyll and Hyde" prairie restoration exhibit was not so much a garden as an educational display, but I'm a huge fan of native plants and of prairies in general and it made me happy to see other people enjoying it and asking questions. 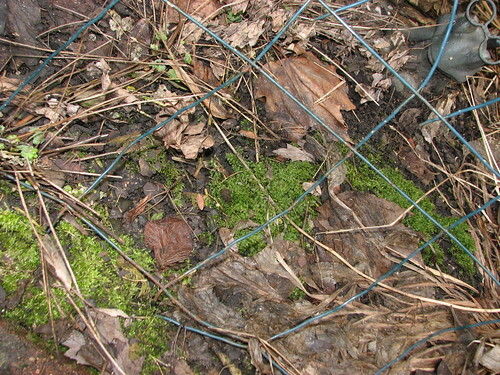 The display starts with a tangle of buckthorn, phragmites and garlic mustard, hated invasives all. Then viewers move into an area of buckthorn stumps painted with herbicide and learn about strategies for removing unwanted vegetation. Next they see a prairie in its full glory (well, spring glory; a prairie's true glory is in late summer!) and learn about controlled burns to keep the woody vegetation in check. 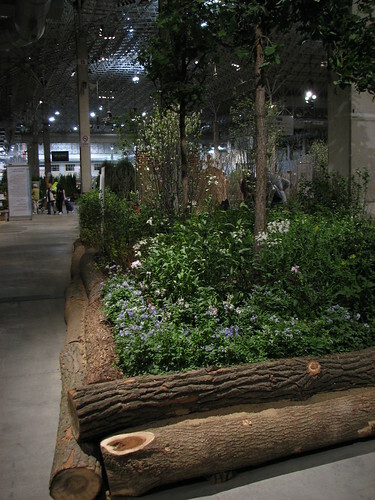 One of my favorite details was the use of logs, lengthwise and short stumps, as edging. I know Belgard sponsors the show but seriously, how much tan retaining wall can a person look at in a day? 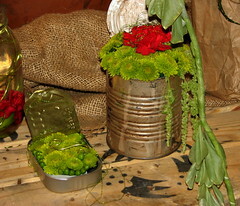 We were very surprised by the small number of plants in the horticulture contest. In past years seeing the entries has been one of the best parts of the show but this year it seemed sparse (or were these only the winners being shown? Still, underwhelming.). 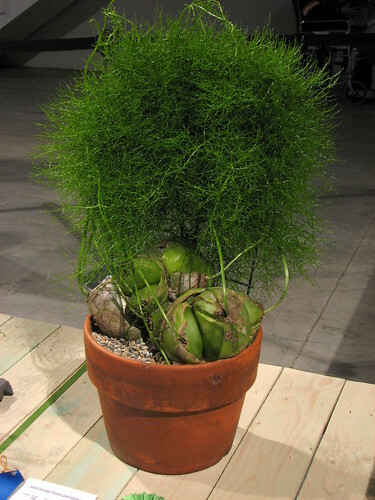 My favorite was this Bowiea volubilis (Best in Show, I believe); if you aren't already sick of me talking about Bowiea, let me tell you, I love these things. Mine aspires to be this impressive someday. The marketplace of course is lots of fun and even now I'm thinking of things I wish I had purchased. Oh well, next year! Ted's Greenhouse is the highlight for some of us. 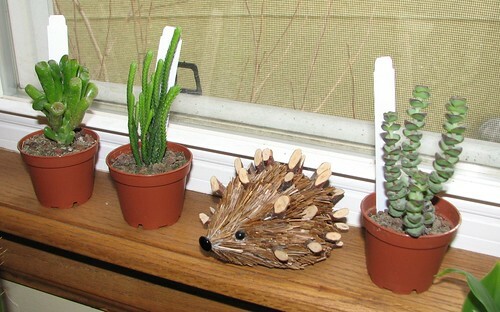 After agonizing for hours, I brought home four cute little succulents, plus a fat spiny Echinofossulocactus for TMCH's office. And I did buy the hedgehog I wanted. Yay! 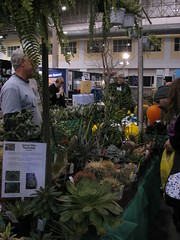 Thanks to MrBrownThumb and the generosity of the show's organizers, many of us had media passes to the show. I met up with several other garden bloggers on Sunday: MrBrownThumb, Linda/GardenGirl, Alexander/Finding My Green Thumb, Gina/MySkinnyGarden, Kylee and Louise/OurLittleAcre, Cara/BlueHydrangea, Xanboni, Beth Botts/Growing in Chicago, and ShawnaCoronado (I hope I'm not forgetting anyone!). On Wednesday I went back with MrBrownThumb and Monica/GardenFaerie, and we scored free cheesecake without having to sit through a lesson on how to make it. 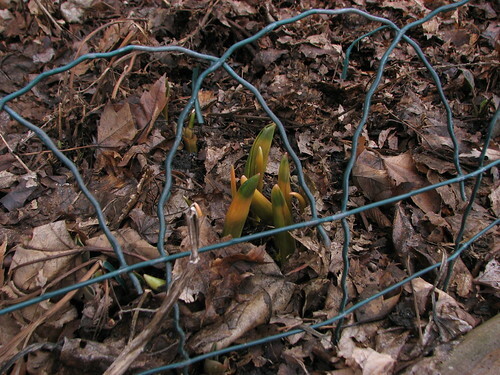 Now maybe I can survive until Real Spring gets here! The 2010 Perennial Plant of the Year is one that I've been growing for several years now, and I highly recommend it! 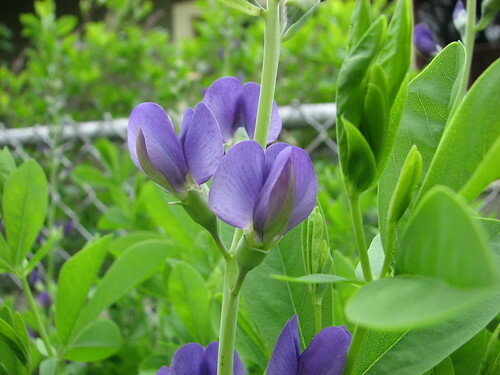 Baptisia australis, blue false indigo, is a native prairie plant that I added to my prairie garden for some height and structure. 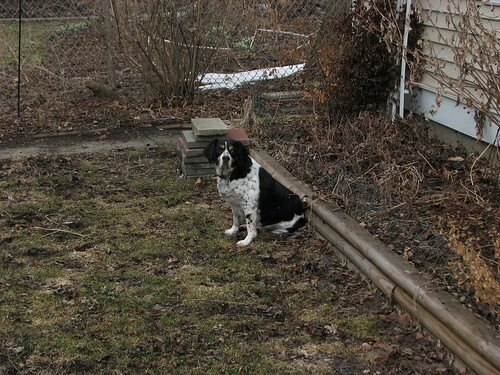 It's a tender shrub that dies back to the ground each winter but quickly grows back in spring. Racemes of dramatic blue-purple flowers emerge in early June and are as beautiful and interesting as any Fabaceous flowers, but honestly I grow it for the foliage. 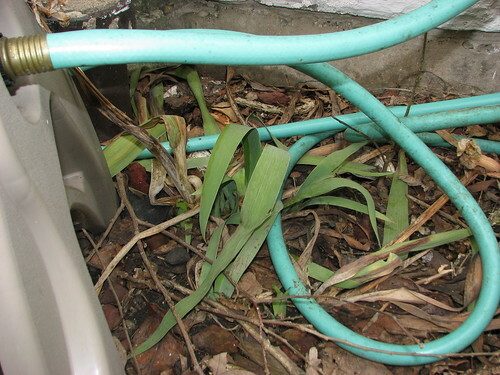 The bluish-green leaves look cool and refreshing on a hot summer day and I've never seen any sign of sunburn or wilt even though I grow it in full sun. 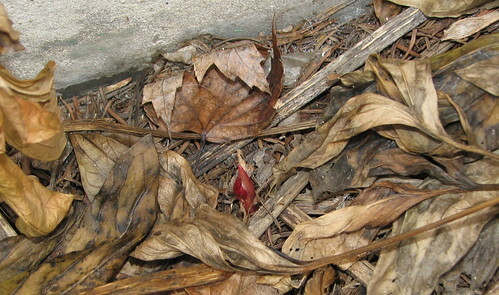 The shrub then develops cool black seed pods (legumes) that rattle when you shake them; those persist until fall when they split open and drop seeds everywhere. 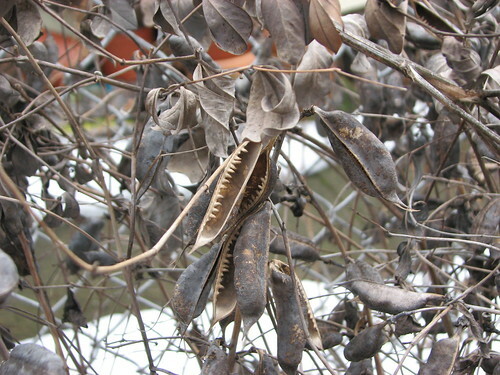 Then the dried pods stay around all winter, looking like toothy shark mouths; seeing them in the garden this morning is the reason I felt compelled to talk about the species today! Last year I started noticing seedlings in the garden and I hope to rescue some and give them away or plant them elsewhere. 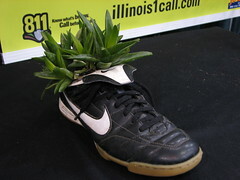 I don't know yet how sturdy those seedlings will be. Rumor has it the plants don't like to be moved because of the long taproot, so I hope to relocate them while they're young. 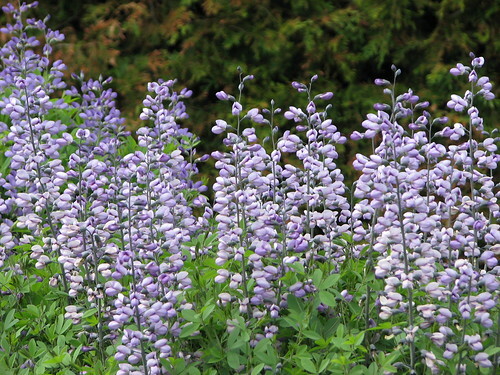 Baptisia gets large, up to 4 feet tall and 3-4 feet wide. Other Baptisia species come in white, cream, and yellow, and the fabulous Jim Ault has developed some very cool hybrids for the Chicagoland Grows plant introduction program. 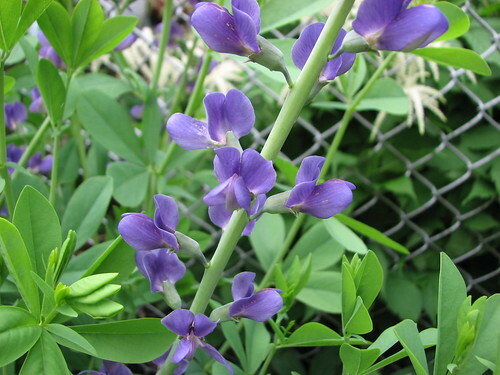 I am also growing Baptisia leucophaea, cream false indigo, for the Native Seed Gardeners project, or at least I am if the tiny plants survived the winter. Species tulips. Hopefully the orange stripes will go away now that they're exposed to the sunlight. 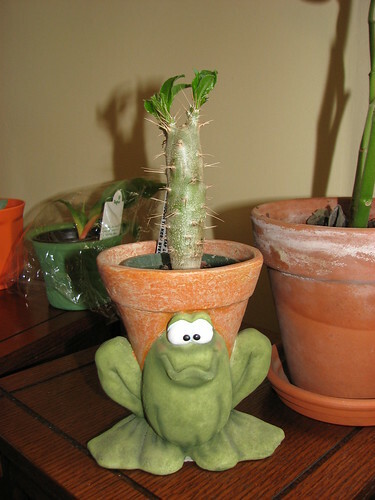 Peony sprout. I don't even like peonies but, well, there it is. 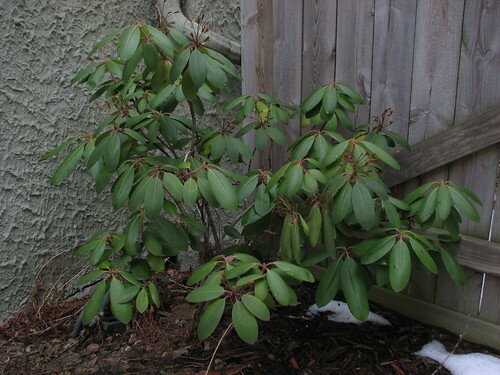 The rhododendron survived the winter just fine in its sheltered corner. Two species of moss now live in my shade garden, one leafy and one fuzzy (those are technical bryophyte terms, I'm sure). 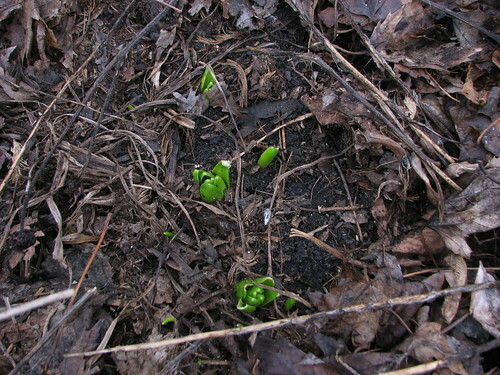 Also, the columbines are starting to grow. Lucy keeps an eye on the neighborhood squirrels and birds. She takes her job very seriously. 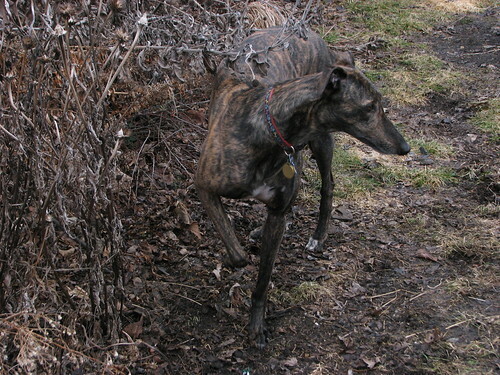 Foley blends in well with the dead winter vegetation. Need to tie a bright pink bow around her neck so we can find her. 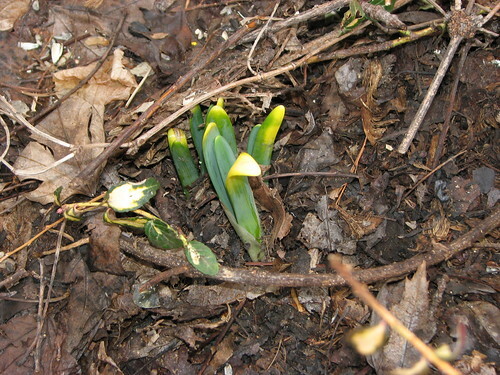 What's growing in your yard?